Thanks to Hot Water we can see the absurdity of the current manager of the UP Steam program, how sad.I feel happy that I had the oppurtinity to ride behing 3985 and 844 while they were running,we may never get the Chance again. The only "absurdity" here is that one man's personal vendetta continues to be allowed to be posted to this day! I have confidence that if the UP wants to run 3985 & 844 again, they will. What you really need to worry about is the UP hierarchy being invaded by the kind of people that don't like steam. ow for more than one person to eat. The Steam program has got to show a real payoff. It has got to show a relivence. UP management is no longer going to allow money to be flushed down a steam restoration toilet. Back in the Steve Lee era it did totally justify its existence as a PR tool. It stopped doing that right after the management change. It went from being a functioning viable steam program to a invisible steam shop. That is what is going to kill the UP steam Program in the end. I personally already think its to late. The lack of presence has already killed it. Put in a call to Hollywood for their best stunt man! "Roof walk? I don't need no stinkin' roof walk!" Well have fun sitting at home! Source: Official Union Pacific Steam Club • Cheyenne, Wyoming • Photo by: Cliff Simmons • Posted February 24, 2019 • No copyright infringement. New photos from the The Official Union Pacific Steam Sleem Club coming this week. 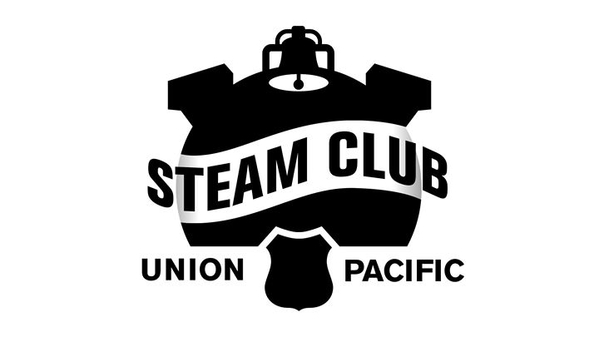 The Union Pacific Steam Shop planned to release the Big Boy No. 4014 and Living Legend No. 844 tour schedules earlier this month. However, details concerning the route and schedule are still being worked out. Once the schedule is finalized, UP Steam Club members will be the first to receive this information. Not sure if this is good news or bad news for rail-fans but we have to be flexible. I was planning my summer vacation schedules around this event. Given the lack of any details and now another delay in providing a "schedule of events", I said "screw it" and booked a trip to Poland to drive (run) and fire REAL, REVENUE, HIGH SPEED Mainline STEAM commuter train service. You read that right, you can do it also! You made an EXCELLENT choice, in my opinion! Would I be safe in assuming that a lack of any FRA PTC waivers has caused a delay in the UP steam scheduling? I doubt it. I believe it is more related to reassembling 4014 and working towards a steam test, and then future break-in operations within the Cheyenne Terminal. Question for Hotwater, The last several years here in Omaha, Up has been doing a lot of rail upgrades and Curve smoothing along the west side of the river and at the interchange in South O. You think they're capable of getting the 14 to CWS home plate now? I know the 65 could not negotiate specific switches and radius curves previously, But most of these areas have been redone just as of recent. Question for Hotwater, The last several years here in Omaha, Up has been doing a lot of rail upgrades and Curve smoothing along the west side of the river and at the interchange in South O. You think they're capable of getting the 14 to CWS home plate now? But most of these areas have been redone just as of recent. If the 844 could negate the track, then things should be OK for an articulated. However, backing up is much more of an issue with that pedestal tender. UP is now the only railroad with a steam program, but NS still allows deadhead moves of 765 and 611. If 611 returns to NCTM this year, it will have to use NS to get there. 765 is probably returning to CVSR in September, and maybe Metra as well. But with the Amtrak business, there will be zero public mainline excursions this year, and the UP 844 excursions are over as well because the Denver Post can no longer afford to sponsor them. To ride behind steam for long distance, you’ll have to go to Grand Canyon, TVRM, Reading and Northern, etc. Until 765 and 611 have PTC installed, there will have to be a diesel guiding them. Unfortunately, I highly doubt the 765 will return to Chicago this year since Metra does have PTC. The Joliet Rocket may still run, but behind a vintage diesel instead of a steam locomotive. Personally, that's sad for me; I always will consider Chicago to be the 765's second home. But the Big Boy and 844 will certainly run excursions in the future! The schedule isn't released yet, so you never know what might happen (other than May 10). That makes sense. I find it funny how many people think that 4014 will go directly from a steam test to hooking up to the passenger equipment to go straight to Utah for the 150th events. You overlooked how friendly BNSF has been to qualified steam operators. I've never heard of that. Which operators? How about AT&SF #3751, SP&S 700, Milwaukee Road #261, and of course SP 4449. Not quite so friendly to Frisco 1522, alas. In fact the UP was VERY friendly to Frisco 1522, on more than one occasion. However, the group in charge of 1522 was getting "long in the tooth", and the engine was coming do for some major maintenance and inspections, so they all simply decided to call it quits, and folded their tent. Thus, the 1522 was returned to the museum in St Louis. I thought the PTC mandate was due at the end od the year. After reading the letter from the FRA, it seems that the right hand doesn't know what the left hand is doing within UP. I don't know. UP requested a waiver, and the FRA denied the request, because at this time they don't even need a waiver. My point exactly. Wonder why someone, either within the steam dept., or not, thought that the steam locomotives needed a waver? 11K miles. Lot more than from home base to Salt Lake City. Yes, but as the UP bashers will be quick to point out, 11K miles isn't even four times across the USA. No wonder they say that the UP steam program is dead. Just for kicks, how about comparing that to previous years, say prior to 2011, when there were at least one operational steam locomotive EVERY YEAR, and sometimes two operational steam locomotives, plus an A-B-A set of executive E units and/or a DDA40X. Crunch time is coming. Little over two months out. With 10 weeks until the Golden Spike event I'm sure the UP Steam shop crew is under tremendous pressure to complete work on 4014 and have several test runs on a main (Denver line?) before making the run to Ogden. Of the remaining tasks which of them present the biggest challenge/risk? Is installation and tuning the oil burners a big deal? Failure of 4014 to show up under steam would be an embarrassment felt right to the board room. From a PR perspective there is no next year. 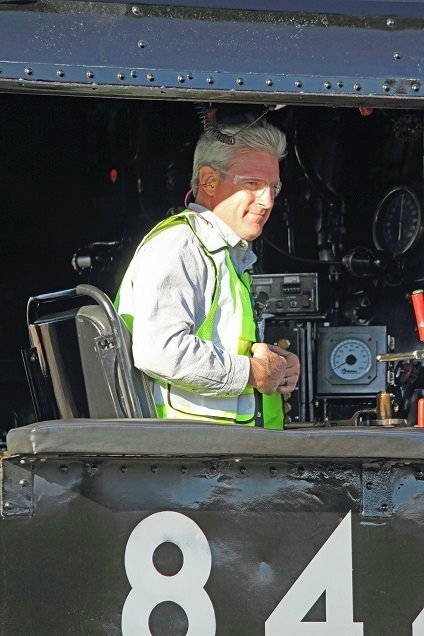 I'm rooting for the UP crew as future corporate support of heritage steam may largely rest with the Golden Spike event receiving favorable nationwide publicity. With 10 weeks until the Golden Spike event I'm sure the UP Steam shop crew is under tremendous pressure to complete work on 4014 and have several test runs on a main (Denver line?) before making the run to Ogden. Of the remaining tasks which of them present the biggest challenge/risk? Is installation and tuning the oil burners a big deal? Failure of 4014 to show up under steam would be an embarrassment felt right to the board room. From a PR perspective there is no next year. 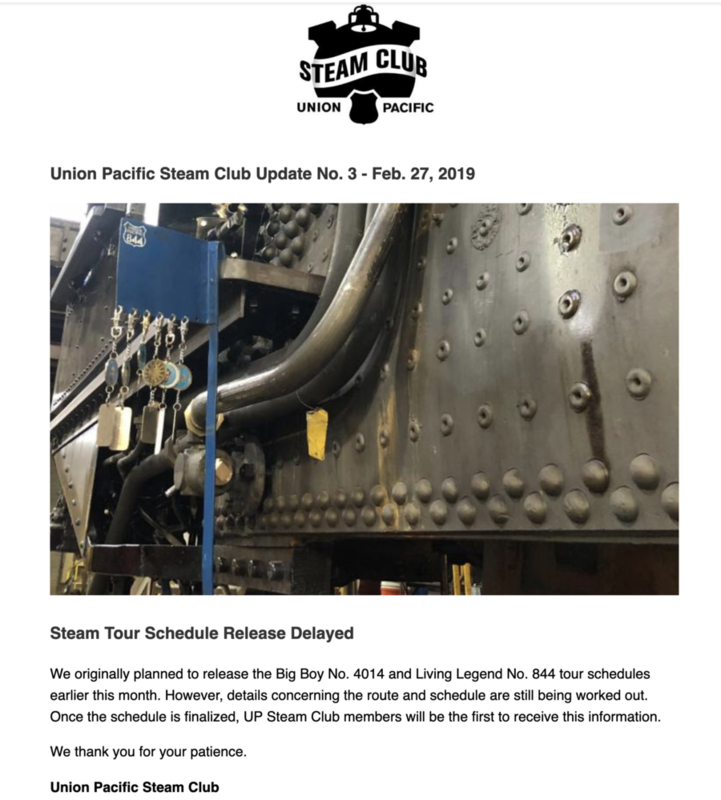 I'm rooting for the UP crew as future corporate support of heritage steam may largely rest with the Golden Spike event receiving favorable nationwide publicity. Dead as a doornail Kelly! Planning on 11k miles and actually doing it are two different things. Let’s see how it plays out the rest of the year. That subject was brought up, and extensively discussed, way back last year. The bottom line; no way that SP 4449 was going to be allowed to share ANY of the publicity and limelight with the Union Pacific's 150th event in Utah! Hum...Were the history books rewritten? I thought the had part of building the first transcon was done by the CENTRAL PACIFIC! Yes, SP was bought by UP in 1996. And UP will do what UP wants. But a possible history lesson lost. The iconic steam locomotives will join together in a public display for the first time May 9 in Ogden, Utah, during Union Pacific's celebratory event marking the transcontinental railroad's 150th anniversary. The festivities include recreating the iconic photo taken May 10, 1869, when the last spike was tapped into place at Promontory Summit, creating America's first transcontinental railroad. Union Pacific no longer has tracks near Promontory Summit. They were removed to support the scrap metal projects during World War II. No. 844 will leave Cheyenne, Wyoming, April 27. It will make several brief whistle-stops in communities along its route, arriving in Ogden on April 28. The Living Legend will be on display at Ogden Union Station through May 11. No. 4014 will leave Cheyenne May 4 following a 9:30 a.m. MT christening ceremony at the historic Cheyenne Depot and arrive in Ogden for the May 9 celebratory event at Ogden Union Station. The Big Boy also will make several whistle-stops in communities along its route. A comprehensive schedule for the April – May tour, including additional locations, display times and No. 844 and No. 4014 GPS location tracking information is available at http://upsteam.com. Due to the dynamic nature of these operations, running times and scheduled stops are subject to change. The 150th anniversary celebration will continue throughout the year with No. 4014 visiting many states across the Union Pacific system. A tentative schedule with tour locations and dates will be published in the near future. I heard seriously heard you can bet in Vegas on if 4014 actually get to Ogden for the 150th, though nobody seems to know where. Man, that's a bet I'd love to lose, betting against 4014. Well, one thing for sure. There will be no doubleheader! One thing we do know is no 844 public excursion this year from Denver. They decided to end it because the newspaper could no longer afford to sponsor it. Oh well, if you want to ride a long steam excursion this year in the US there’s always the Grand Canyon, Cumbres & Toltec, Durango, TVRM, RBMN, etc. The UP thing is mostly for chasers and for people to watch them arrive at cities. UP doesn’t want to bother with liability insurance for excursions.